Data binds seamlessly with various local and remote data sources such as: JSON, RESTful services, OData services, and WCF services. There is built-in support for better event handling, such as easier appointment creation and editing using the default event editor or through intuitive drag-and-resize actions. Easily configurable recurring events to repeat on a daily, weekly, monthly, or yearly basis. Change the look and feel of events by customizing their default appearance and style using templates. Reschedule appointments easily by dragging them onto the required time slots. You can also see the live time updates over the dragged appointments. Easily extend a Scheduler event’s time by resizing either its start or end handlers. You can also see the live time updates over the resized appointments. Built-in support is available for assigning resources to events as well as scheduling resources. 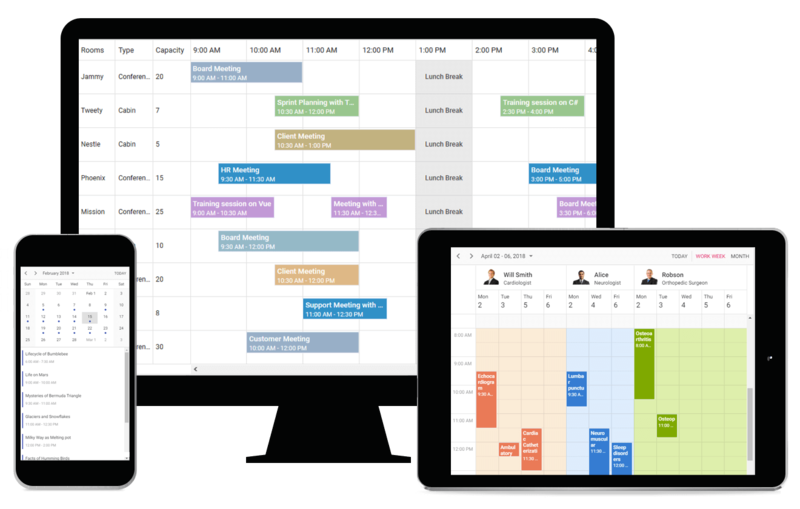 Group appointments based on resources or dates. Grouping resources by date provides a quick overview of each resource’s availability. You can also set different working days for each resource. A new compact layout for displaying resources on a mobile screen, brings clear visibility of events of each individual resource.